Having tried once before (see blog entry for 13th October 2013) to access Jingellic Trig, I was determined to try again. An opportunity came when John, VK2YW, suggested making a joint assault on the summit following some information received from a friend of his who has occasional cause to visit the summit in the course of his work. That information indicated that there was another trail that could be followed and that might prove better than the Jingellic Trig Trail. More on that later. Having agreed that Jingellic Trig would be the target for this trip, John and I met for a coffee and a planning session in the bakery at Holbrook. It’s always a good place to pull off the Hume Highway, and you’re assured of a great coffee and some goodies from the bakery to go with it. John and I decided that without any hard information on the alternative route, we would go in the same way that I had attempted last time, that is via Yensch’s Road, the Miller Fire Trail and the Jingellic Trig Trail. We agreed that as it hadn’t rained much in the past few weeks, it was likely that the trail would have dried out and that the mud was less likely to be a problem. We turned off the Holbrook – Jingellic Road onto Yenschs Road and followed it along to the Miller Fire Trail. Yensch’s Road is dirt and I raised a dense dust cloud as I drove along it, leaving poor John choking behind me. This became less of a problem when we turned onto the Miller Fire Trail as its surface was more densely packed, and we were travelling slower because of the roughness of the trail and the frequent “speed humps”. About 500m into Millers we passed a trail on the right with a sign announcing “Mt Paynter Trail, Authorised Vehicles Only.” We consulted but decided that in the absence of any detailed information we’d give it a miss and continue as we were going. The going was getting tougher: Millers requires a 4WD with plenty of ground clearance, but there was some much more interesting driving to come. We turned onto the Jingellic Trig Trail and began the climb just as I had done on my previous visit. This trail is very steep in places and the surface is deeply rutted, but as expected it was much drier this time and we got past the mud without incident. Not far past that, though, we encountered the first of a great many tree branches that had fallen across the trail. We stopped, put on our gloves and hauled the debris to the side. Then we went on again, only to find more debris about 100m further along. And more after that, and then more… I lost count of how many times we stopped to clear the trail. Fortunately it was all small, light stuff and didn’t need us to apply a chainsaw, though both John and I had brought one just in case. 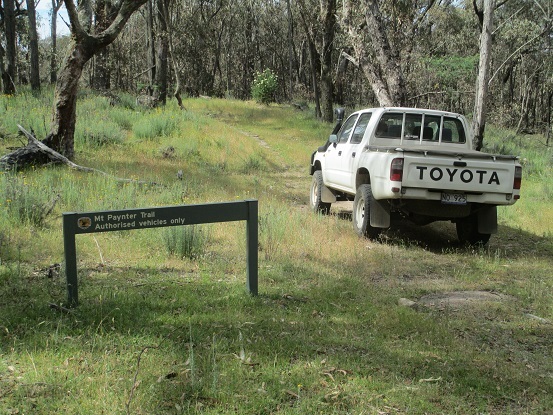 The Jingellic Trig Trail requires a 4WD with a lot of ground clearance and a low range gearbox. I would not recommend attempting this trail unless you are an experienced 4WDer, and you must go equipped with recovery gear and all the usual tools and equipment in case the worst comes to the worst. Going in company with another 4WD is a Really Good Idea. It seemed like a very long, slow haul up the Jingellic Trig Trail but eventually we knew we must be nearing the summit. As we neared the top we passed another trail, and on looking closer I noted the sign: “Mt Paynter Trail, Authorised Vehicles Only.” Aha! We agreed to check it out on the way down. Meanwhile I could see blue sky ahead through the trees and sure enough, to our relief the trail meandered out of the trees and into a wide clearing at the top of the hill. There is a solar powered commercial repeater site on the summit and we experienced a little breakthrough on 146.5MHz when we were parked close to the tower, though as we were planning to activate on HF we weren’t too bothered about that. We decided to set up both John’s station and mine so that we could compare the antennas we were using. John had a half-size G5RV slung from a squid pole, while I was using a half-wave link dipole for 7, 10 and 14MHz hung from a tree branch. We were both using the ubiquitous FT817 so the only difference between our stations was the antennas. Fortunately there was a sniff of a 3G signal on the Summit and I managed to put out a spot via SOTA Goat. Then we both went to my station and I put out a call on 7.090. The band was very quiet and it took a few minutes before we made the first contact, but after that they came thick and fast and we both qualified the activation. When the stream of callers dried up we took a break, had a bite of lunch, and considered our options for the afternoon. 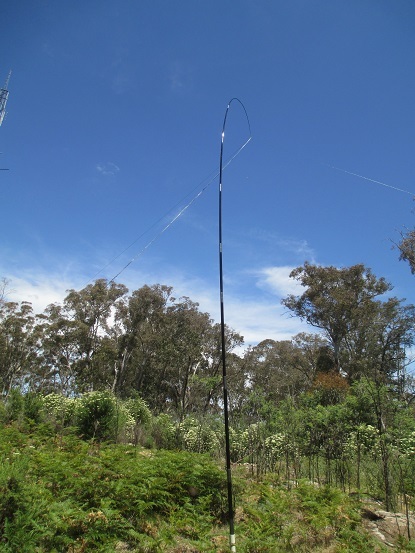 We decided to stay put at Jingellic Trig and try to work a few more callers using both of our stations, to get a comparison of the two antennas. So we did that for a while and found that there really wasn’t anything much to differentiate them, at least not that we could determine from the signal reports we were receiving. One or two callers said that the G5RV was prone to fast, deep QSB whereas the dipole seemed to be a more consistent signal, but I’m not sure whether there’s anything one can read into that. The G5RV is probably easier to use as a multi-band antenna, but even that is debatable if the link dipole is set up for all the bands you want to use. I estimate that it took John about 15 seconds to swap from 7MHz to 14MHz, with a quick tweak of the ATU to bring the SWR down to something that the FT817 was happy with. In contrast, to accomplish the same thing I would have to get up out of my chair, pop out the two 14MHz links, sit back down and hit the FT817’s BAND switch a couple of times. I reckon that would take me about 15 seconds. I’m very happy with the ease of use of my link dipole, but I would be equally happy with John’s G5RV/ATU setup. 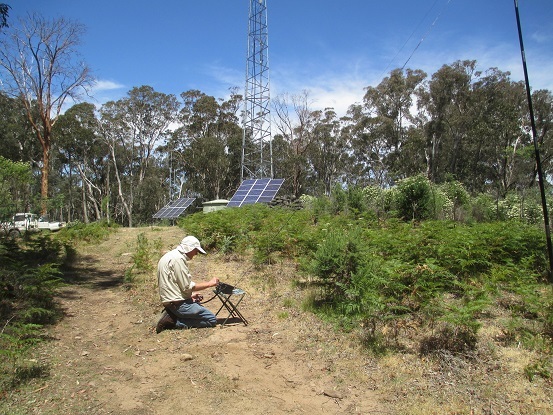 John made a quick foray onto 14MHz and even though I put out a spot for him there were only one or two takers. The band was very quiet with not much to be heard, either local or DX. Perhaps if we had hung around for a while until the EU stations had had their breakfast we might have done better, but by this time we’d both had enough and were ready to pack up. While John started taking down his antenna I strolled down the hill, out of the activation zone, and made a quick QSO with John on 146.5. Then I came back up and John wandered down to do the same thing, so that we both ended up completing both the activation and chasing of this summit. Heading down, I set my GPS to track where we went. John consulted all of the topographic and NPWS maps on his tablet PC but none of them showed the Mt Paynter Trail. Obeying the “Authorised Vehicles Only” advice, John authorised me to use the Mt Paynter Trail and I authorised him to follow me, so, half expecting to encounter a locked gate at some point, we went that way to see firstly if it would indeed take us back to Millers Trail and secondly whether it was in better condition than the Jingellic Trig Trail. What can I say about the Mt Paynter Trail? Firstly, it is not for the fainthearted. In comparison with the Jingellic Trig Trail it’s equally challenging both to vehicle and driver, with some extremely steep sections, deep ruts, huge speed humps and loose surfaces. 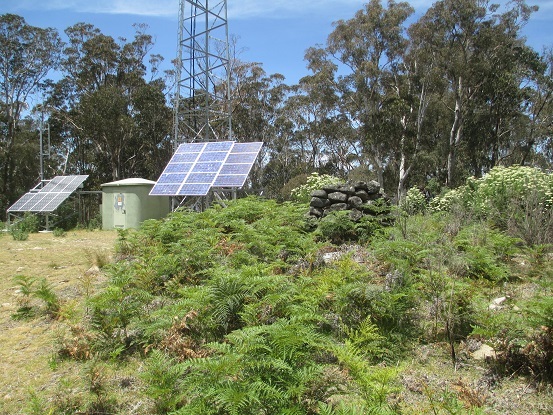 However, it does appear to be the route of choice for the radio techs who visit the Jingellic Trig site from time to time, as there were signs that someone had passed that way not too long before. Also, there were no trees or other debris across the trail and we didn’t have to stop to clear the way. It did, in fact, connect to the Miller Fire Trail at the point we had expected and there were no gates or other obstructions. I estimate that it is about 5km shorter than the Jingellic Trig Trail route, and would be my recommendation for anyone else wanting to activate this Summit. 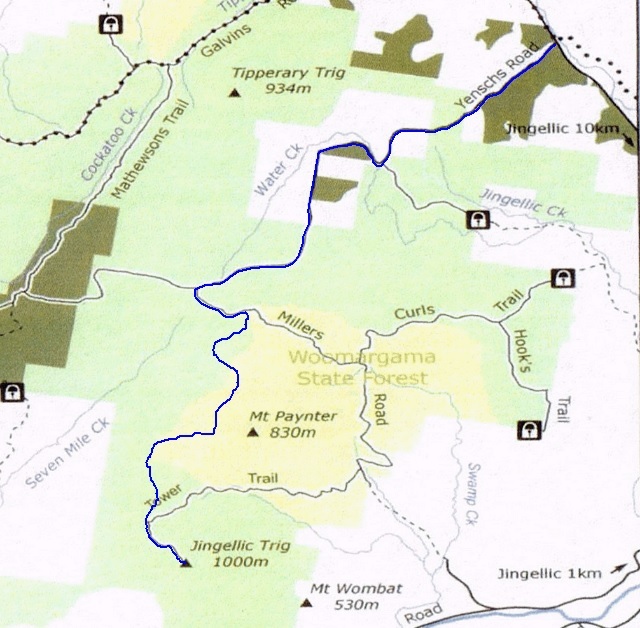 My GPS track is shown on the map, with the route back from Jingellic Trig to the Holbrook Road shown in blue. John and I both thoroughly enjoyed this expedition, as it combined some challenging 4WDing with activation of a new Summit. Not only that but it gave us the opportunity to compare notes on our respective SOTA portable stations and get some on-air comparisons. In all, a great day. On turning back onto the Holbrook Road I reflected on what a wonderful invention Tarmac is. If you’re going to take on a challenging 4WD run in to a Summit, it’s a good idea to have company and take more than one vehicle. Pay attention to warnings about roads that are “dry weather only”. They mean what they say. Check the weather forecast before setting out, and keep an eye on the weather while you’re on the expedition. You don’t want to risk getting stuck out on a Summit or in the bush if it rains. At the first sign of bad weather, abandon the expedition. Spotting is very important. It’s great if you can spot yourself as we did on this trip, but if you can’t then it’s important to have someone do it for you. Finally, a question for any entomologists out there: what do flies do when there aren’t any SOTA activators around to torment?